Phnom Penh (FN), April 6 - The European Union registered Skor Thnot Kampong Speu (palm sugar) into Protected Geographical Indications, according to the EU Agriculture: Food and Farming on 3 April 2019. Recognized as the emblem of Cambodia, Skor Thnot Kampong Speu is made from sap of a palm tree collected and processed in three districts located in the centre of Cambodia, EU Agriculture wrote on Facebook. The harvesting of the sugar is done by local sugar producers that climb to the top of the trees to collect the sap from the flowers. Sam Sareoun, President of Kampong Speu Palm Sugar Development Association said that the benefits of sugar palm registrations to EU are three, includes (1) securing job markets for local palm sugar producers; (2) promoting prestige and identity of Cambodia; and (3) promoting health of global citizens who consume palm sugar, as the pure and non-chemical sugar does not have negative impacts on health. According to Sareoun, his Palm Sugar Association has produced about 350 tons of palm sugar, of which 200 tons were sold under geographical indication (GI). 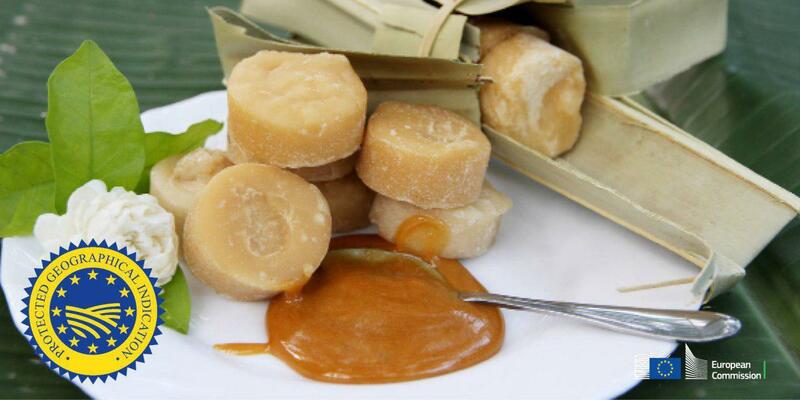 Kampong Speu Palm Sugar was introduced by the Royal Government as a geographical indication in 2010. Cambodia cites the year 1901 as a starting point for the expansion of the culture of the palm sugar, with a royal order directing each farmer to plant the Borassus on his rice field, according to Official Journal of the European Union. In 2005, sugar palm was recognized as the emblem of Cambodia by a Royal Decree. In 1967, Jean Delvert, a well-known French geographer, wrote that the region of Kampong Speu was the main area of cultivation of the palm sugar with 375 000 cultivated trees (Le Paysan cambodgien, Jean Delvert, 1961). Accord­ing to Jean Delvert, in the 1950s farmers in Kampong Speu and Kandal provinces were already reputed for their expertise and know how in Palm sugar harvest: ‘cultivating and farming the Skor Thnot Kampong Speu. Skor Thnot (palm sugar) requires a long experience: in phum (villages), a few people know how to cultivate the thnot; ‘and in most areas no-one is competent: the experts in cultivating are only from the major producing regions (Kandal, Kampong Speu, Kampong Chhnang) which makes the harvest’. A production of crystallized sugar from palm plant has been located in Kampong Speu since the 1970s. The name of ‘Kampong Speu’ is related to sugar production and palm sugar is known as a traditional production of this area. Skor Thnot Kampong Speu production area is a lowland area located in the districts of Oudong and Samrong Torng in Kampong Speu province and the district of Ang Snuol in Kandal province. These palm trees grow on red-yellow podzol soil, a particular type of sandy soil which is at least 80 cm deep, has a gravel layer with good drainage abilities. Studies and analysis have shown that palm saps coming from these three districts have a high sugar concentration. All the palm sugar operators (producers, processors and local traders) acknowledge that the localization of the trees on deep sandy soils is a key factor of the quality of the sugar. The results of the analysis of palm sap coming from different districts and provinces show that in the three districts of the delimited production area, the sugar con­centration in the sap is the highest. This explains the rich aromatic level of Skor Thnot Kampong Speu. The harvesting of palm sugar is done by local skilled and agile sugar producers that climb to the top of the palm trees to collect the sap from the palm flowers. The palm sap is collected only by using Bamboo container (a Bampong) because the use of plastic container is prohibited. A small piece of Popel wood or Koki wood is placed in the Bampong to decrease the speed of fermentation of the palm sap. The processing of the palm sap requires the use of typical tools such as Antok and Khnos. The aromatic quality of the sap depends on both the number of Bampongs placed at the level of the inflorescence and on the flow of the sap. The producer can put a maximum of one female flower or four male flowers of palm tree per one container. Each container is collected from the palm tree within 15 hours after they were installed, and the processing of the sap harvested starts within 2 hours after the sap is collected. Producers have developed a specific knowledge to cook the sap in order to extract a high-quality sugar, depend­ ing on the final product they want to obtain.